Rosmarinus officinalis, Creeping rosemary, is the perfect evergreen trailing plant to spill over retaining walls, containers, or even use as a groundcover. Creeping rosemary looks natural in a variety of landscape styles such as cottage, Mediterranean, water-wise, and of course herb gardens, just to name a few. Arching branches with dark evergreen foliage compliments perennial beds and shrubs plantings. 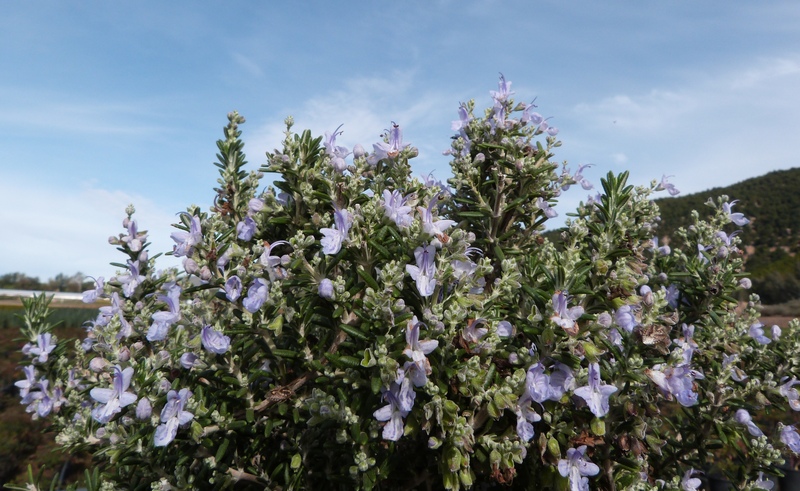 In spring, and again at varied times throughout the growing season, creeping rosemary produces an abundance of small blue flowers. Local bees find the flowers irresistible. The foliage is extremely fragrant and edible making creeping rosemary a multi-purpose edible ornamental plant. When planting creeping rosemary, be sure to plant in a sunny location in well-draining soil; amend the soil well to improve drainage. Once established, plants require little supplemental water to thrive. Though drought tolerant, be sure to water well before any cold snaps or freezing temperatures to lessen damage. This tough plant is not a fan of high humidity or excess moisture, so consider your climate before planting. Creeping rosemary is relatively pest and disease free.